This salad is another fresh and healthy dish on a warm summer day, or if you want to remember the summer. Start with fresh mixed greens, add vegetables. I love cook cucumbers, red bell pepper, grape tomatoes, and grated carrots. 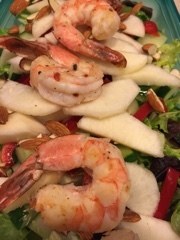 Add ripe nectarine, almonds and grilled shrimp. -grill shrimp for 2-3 min or until shrimp is pink.